Masterpiece's new patent-pending Panel Porter system allows you to easily transport two wet canvas panels of any size, because your artwork should dictate the size of your carrier, not the other way around! 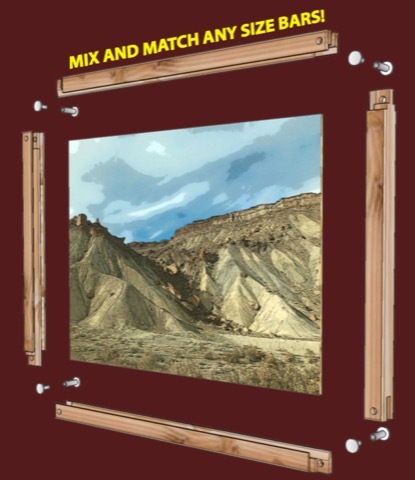 Steel pins or brass fasteners secure the frame together to protect your precious artwork. Air holes in the corners allow your painting to breathe while drying. Perfect for transporting artwork on the go or for shipping. Versatile, secure and a great value that saves you money! Just mix and match any two sizes of bars to make a carrier. Buy a pair of 9" bars and another pair of 12" bars to make a 9" × 12" carrier. Buy another pair of 16" bars and you can reuse your 12" bars to make a 12" × 16" carrier. Each pair of bars comes with the necessary pins and fasteners.